Conceptual Render of Cafe and Mechanical shop. Jammer Cafe Motors is a unique shop design that uses a hybrid concept, combining a specialty coffee shop, full restaurant and brewery tasting room, a mechanic shop with retail area. The two main areas are split by a wall of windows that showcases both qualified mechanics and customers working on motorcycles, mopeds and any kind of recreational vehicle. Rendering of current build at 350 west 8th. By offering bench rentals, Jammer Cafe Motors fulfills a major need in dense urban communities. A place where people can congregate and enjoy a national past time that has lasted since the creation of the motorcycle. Jammer Cafe provides enthusiasts and coffee lovers with a safe, professional and friendly place to enjoy coffee food and beer, socialize and tinker with recreation vehicles. Jammer Cafe started renovations in March 2018. The shop’s grand opening is scheduled for Fall 2018. Development and Building permits are completed. The building is 1 block off of Broadway and Cambie st. a very high density foot traffic corner, with local vehicle traffic of over 50,000 vehicles per day. Located in the heart of Mount Pleasant, an area that has been seeing huge growth in media companies, service outlets and mixed residential. The location is perfect to implement a vintage industrial atmosphere with refurbished materials complementing the shop’s interior décor. Be apart of a legacy and lifestyle brand. 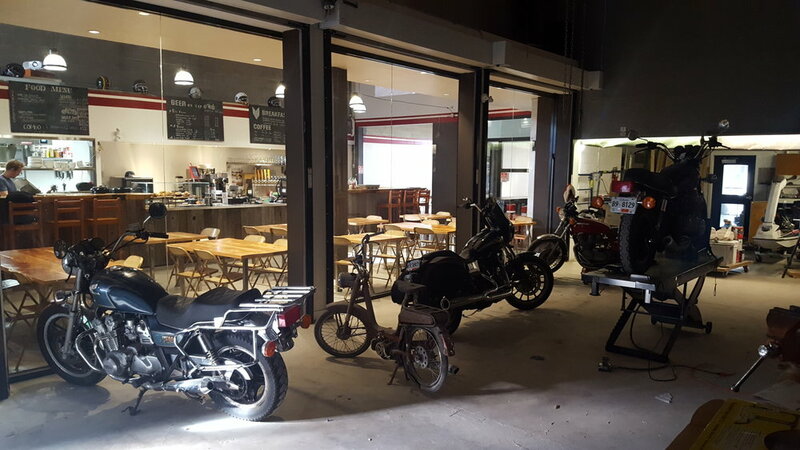 Jammer Cafe Motors is an incorporated, privately held business, looking for investors who identify with the vision of an urban community dream garage and cafe. We are looking for Investors who are enthusiasts and who will contribute to the ownership, mentor and create business relationships to make Jammer Cafe Motors the most exciting new business of 2018. With real estate trends going to smaller homes, with less storage and shop space, Jammer offers a truly innovative type of service that combines similar interests into one space. 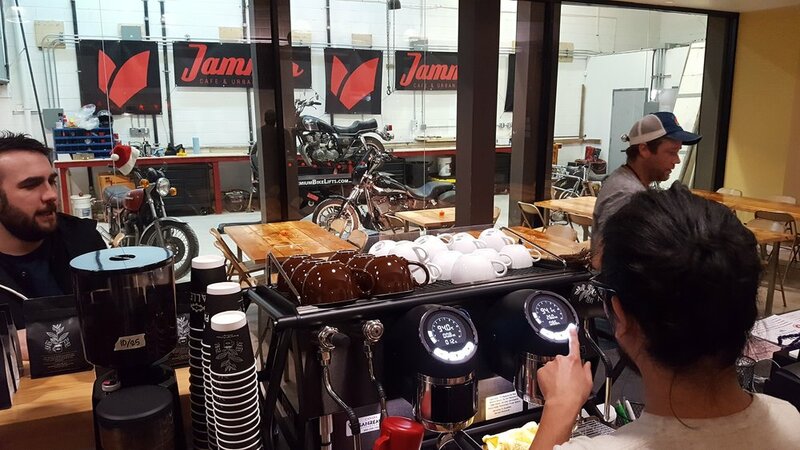 Using a proven hybrid model for multiple sources of revenue, known as retail-tainment, Jammer Cafe Motors will satisfy a growing urban demand; a place where DIY’s and enthusiasts can exercise their motorcycle interests, while also providing coffee lovers a place with a theme and entertainment value. Street city events, weekly in house demos, shows, social media and more. Jammer Cafe has started planning events that will make use of City planning closed street events right in front of our shop and sponsored by Cambie Business Improvement Association (BIA). Organized weekly events with other local dealerships, shops and bike builders to showcase new bikes, concepts, custom bike builders and classic restorations. Direct marketing to the motorcycle enthusiasts through social media and events will quickly establish Jammer as Vancouver’s center of everything motorcycle. The multiple revenue streams provide several sources of income ensuring strong cash flow. The strength in the hybrid business model is that it can adjust with how revenue streams are performing. Hybrid models strengthen the business investment because the fixed costs are shared, lowering total expenses. We believe, however, that our strongest asset is the people and exceptional customer service. Creating a friendly community is our staff’s number one priority. The potential to grow into an international franchise. The Jammer Cafe Motors brand has strong potential to grow into an international franchise. A brand which could re-invent how motorcycle dealerships do business. Jammer Cafe is to become the friendly smiling face of motorcycle lifestyle. An inviting atmosphere that attracts a wider demographic of people into the world of recreational motor sports. Jammer Cafe Motors will aim to be the brand that represents builders and individuals that are self taught with the pride to have done things on their own. Jammer Cafe is also the place that provides a stage and exposure for top builders and the art of their craft. Cafe Racer clothing, parts and accessories. With the growth of the business Jammer Cafe Motors will expand the selection of its own brand and also sell other Cafe Racer builder clothing, parts and accessories. By the end of year one, to start having our own Jammer Cafe Motors developed accessories. We also aim to develop our own custom café racer builds that will make the Jammer name known within bike builder circles internationally.